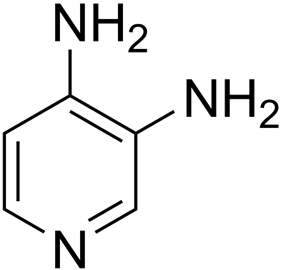 3,4-Diaminopyridine (or 3,4-DAP) is an formula C5H3N(NH2)2. It is formally derived from pyridine by substitution of the 3 and 4 positions with an amino group. With the International Nonproprietary Name amifampridine, it is used as a drug, predominantly in the treatment of a number of rare muscle diseases. In Europe, the phosphate salt of amifampridine has been licenced as Firdapse (BioMarin Pharmaceutical) in 2010 as an orphan drug. In the United States, Firdapse is under investigation for the treatment of Lambert-Eaton myasthenic syndrome by Catalyst Pharmaceuticals. Although not approved for pharmaceutical use in the United States, 3,4-diaminopyridine is available under compassionate use regulations for the treatment of Lambert-Eaton myasthenic syndrome (LEMS). In Lambert-Eaton syndrome, acetylcholine release is inhibited as antibodies meant to target characteristic cancers target Ca2+ channels on the prejunctional membrane instead. 3,4-Diaminopyridine works by blocking potassium channel efflux in nerve terminals so that action potential duration is increased. Ca2+ channels can then be open for a longer time and allow greater acetylcholine release to stimulate muscle at the end plate. A 2005 systematic review from the Cochrane Collaboration found some data favouring its use in LEMS. It is also used to treat many of the congenital myasthenic syndromes, particularly those with defects in choline acetyltransferase, downstream kinase 7, and those where any kind of defect causes "fast channel" behaviour of the acetylcholine receptor. 3,4-Diaminopyridine has also been proposed for the treatment of multiple sclerosis, but a 2002 systematic review found that there was little unbiased data to support its use in MS. The licensing of 3,4-diaminopyridine in 2010 led to a sharp increase in price for the drug. In some cases, this has led to hospitals using an unlicenced form rather than the licensed agent, as the price difference proved prohibitive. BioMarin has been criticised for licencing the drug on the basis of previously conducted research, and yet charging exorbitantly for it. A group of UK neurologists and pediatricians have petitioned to prime minister David Cameron in an open letter to review the situation. The company has responded that it submitted the licensing request at the suggestion of the French government, and points out that the increased cost of a licensed drug also means that it is monitored by regulatory authorities (e.g. for uncommon side-effects), a process that was previously not present. In 2010, company scientists published evidence that amifampridine should be the first-line treatment for LEMS. In the United States, Catalyst Pharmaceuticals has made 3,4-diaminopyridine phosphate available to patients at no cost under an expanded access program. Patients must be diagnosed with Lambert-Eaton myasthenic syndrome and meet appropriate inclusion criteria. ^ AAEM Quality Assurance Committee. American Association of Electrodiagnostic Medicine. (2001). "Practice parameter for repetitive nerve stimulation and single fiber EMG evaluation of adults with suspected myasthena gravis or Lambert-Eaton myasthenic syndrome: summary statement". Muscle Nerve 24 (9): 1236–1238. ^ Lundh H, Nilsson O, Rosen I, Johansson S. (1993). "Practical aspects of 3,4-diaminopyridine treatment of the Lambert-Eaton myasthenic syndrome". Acta Neurol Scand 88 (2): 136–140. ^ "Firdapse". European Medicines Agency. Retrieved 2010-09-28. ^ Baker, DE (November 2013). "Breakthrough Drug Approval Process and Postmarketing ADR Reporting.". Hospital pharmacy 48 (10): 796–8. ^ "A Phase 3 Study of Amifampridine Phosphate in Patients With Lambert Eaton Myasthenic Syndrome (LEMS)". ClinicalTrials.gov. National Institutes of Health. Retrieved 28 September 2014. ^ Maddison, P.; Newsom-Davis, J. (2003). "Treatment for Lambert-Eaton myasthenic syndrome". Cochrane Database of Systematic Reviews (CD003279). ^ Argov, Z. (2009). "Management of myasthenic conditions: nonimmune issues". Current Opinion in Neurology 22: 493. ^ Solari, A.; Uitdehaag, B. M.; Giuliani, G.; Pucci, E.; Taus, C.; Solari, A. (2002). Solari, Alessandra, ed. "Cochrane Database of Systematic Reviews". Cochrane database of systematic reviews (Online) (4): CD001330. ^ Daniel Martin (2010-09-27). "Hospitals are forced to use unlicensed medicines to save millions". Daily Mail. Archived from the original on 28 September 2010. Retrieved 2010-09-28. ^ Nicholl DJ, Hilton-Jones D, Palace J et al. (2010). "Open letter to prime minister David Cameron and health secretary Andrew Lansley". BMJ 341: c6466. ^ Hawkes N, Cohen D (2010). "What makes an orphan drug?". BMJ 341: c6459. ^ Quartel A, Turbeville S, Lounsbury D (June 2010). "Current therapy for Lambert-Eaton myasthenic syndrome: development of 3,4-diaminopyridine phosphate salt as first-line symptomatic treatment". Curr Med Res Opin 26 (6): 1363–75. ^ "Expanded Access Study of Amifampridine Phosphate in LEMS, Congenital Myasthenic Syndrome, or Downbeat Nystagmus Patients". ClinicalTrials.gov. National Institutes of Health. Retrieved 28 September 2014.